Yearling buck grunts, doe bleats, doe-in-heat bleats, moderately toned buck grunts, fawn bleats, buck contact grunts, yearling buck tending grunts and even fawn-in-distress bleats are all proven deer calls. Indeed each fall knowledgeable hunters who know how to imitate these vocalizations in the wild tag thousands of whitetails. Yet sometimes big bucks give these same good hunters the slip precisely because these very calls are used. You see, if you spend enough time in the deer woods you will eventually be confronted with a situation where the old standbys are not as effective. In fact, in some cases these basic calls may even be detrimental in your pursuit of a racked buck. Why? Because at that moment, one the following two specialization calls would be more appropriate. Take for example the tending grunts of a 3.5-year-old or older buck. Deep and guttural, they reflect the sexual urgency of a mature big-bodied buck. This vocalization certainly stirs the imagination and sells a lot of grunt tubes in discount stores each fall. Unfortunately, when used in heavily hunted regions, this call will often scare away yearling and 2.5-year-old bucks. 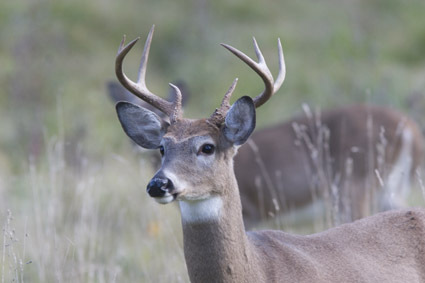 As a result, many knowledgeable hunters refrain from using the tending bucks of a trophy buck when hunting in such an area. However, therein lies the rub. When hunting wilderness regions where wide-racked bucks die of old age without ever seeing or smelling a human being, the tending grunts of a mature buck do indeed attract trophy bucks in part because there are simply more older age-class bucks present in the population. One of my strategies when hunting big woods is to blind call during the pre-rut when bucks are still highly territorial. How? By periodically emitting a series of evenly spaced, staccato-like tending grunts of a mature trophy buck. A snort-wheeze is made by a buck exhaling air through his nose in a very specific cadence. Once you have heard it, you won’t forget it. It occurs when two bucks of similar status suddenly encounter each other, especially around a food source, and serves as a warning to the intruder buck to back off—or there will be a fight. The second time it occurs is when a buck that is tending a hot doe is suddenly confronted by another buck trying to “horn” in on the action. Again, the snort-wheeze serves as a warning. And finally, you will hear a buck make a loud snort-wheeze when a hot doe refuses to stand still long enough to allow breeding to take place. The buck is undoubtedly warning the doe to stand still—or else! Once while still-hunting with archery tackle I had a 150-class 12-pointer snort-wheeze at me 20 times or so thinking I was an intruder buck. I brought him into bow range, but was unable to get a shot due to thick brush. Even so, it was an electrifying experience! The snort-wheeze seems to work best during the peak of the rut when mature bucks are tending does. Your rendition of a snort-wheeze, either alone or added to a tending buck grunt or an estrous doe bleat, may be all it takes to pull a mature buck away from a hot doe. But be prepared, like the buck I just mentioned, he will come in looking for a fight!